Love them or hate them most people agree anything tastes better barbecued. Brussels Sprouts, being the tough little creatures they are, need a little precooking before ceremoniously charring. This recipe softens them in the microwave before giving them their beautiful blackened grill marks and smoky sweet flavor. Turn the grill on medium high. Rinse the Brussels sprouts. Then cut the stem off, mark a ¼ inch X into the base of each sprout, pull off the dark green outer leaves, and cut in half. Place in a medium sized bowl with 1/4th cup water while prepping. Place the bowl in a microwave and cover with a paper towel. Cook for 4 minutes. Meanwhile in a small bowl mix together olive oil, Dijon mustard, salt & pepper. Carefully remove the Brussels sprouts from the microwave. Pour the sauce on top of the sprouts and toss to coat. Place on the grill with tongs and keep the bowl nearby. Turn the sprouts once char marks develop, and then char the other side to taste. Place the sprouts back into the bowl. Toss gently to coat with the remaining sauce on the bottom of the bowl. Serve Hot. A great alternative to standard Brussels sprouts. Very nice, indeed. I love brussels sprouts!! Thanks for sharing!! I love Brussels sprouts!! I have never grilled them before. WOW! Thank you for sharing because this is a keeper for me. 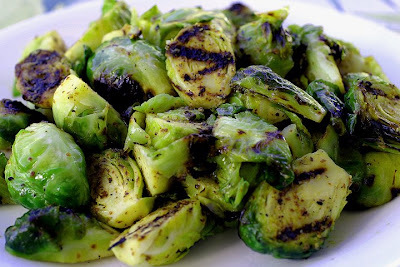 I don't have a grill, but I usually broil my Brussels sprouts with olive oil, salt, pepper and sometimes some herbs. I can't wait to try them with the Dijon! Mmmm mmmm! This is my new favorite blog, by the way! I've tried several recipes, all to resounding oohs and aahs! It's also inspired me to make my own pizzas. I have a stone. It is so much tastier and more affordable than going out for pizza! Thank you, thank you, thank you! I am so glad! I woke up to your comment and it motivated me to start writing down another recipe. Thank-you!